I recently posted about the Mesh Shop VO-70. Inspired by the Volvo Ocean Racer, the VO-70 is a beautifully designed and carefully constructed craft that earns high marks for it’s style, the accuracy of it’s mesh build, and it’s durable BWind 2.5 sail engine. It’s a great boat to cruise across the grid at high speed. I suspect many sailors who get this boat will want to race it, so I wanted to add a few additional comments about VO-70’s racing features. The VO-70 does not use the standard raceline WWC windsetter; instead it introduces a new race wind system, based on Becca Moulliez‘s BWind 2.5. 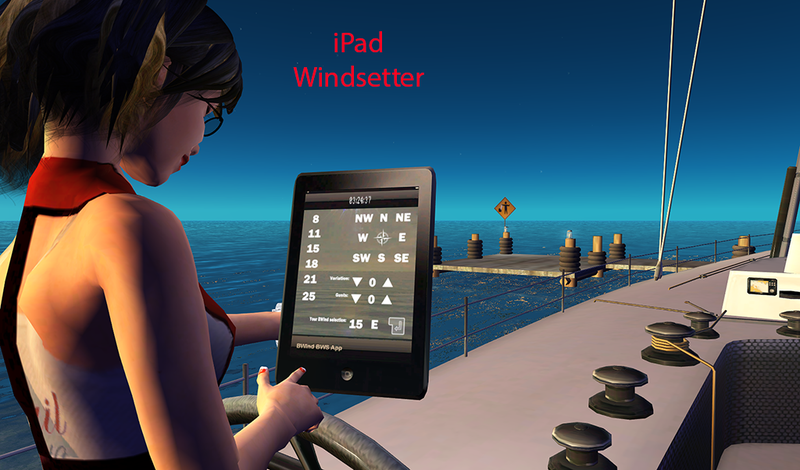 The boat comes with a separate “iPad Contoller” that a skipper or race director can wear to set race wind. The iPad has six options for wind speed and eight wind directions to choose from. When a skipper or race director hit’s ‘enter,’ the wind settings are broadcast to all nearby boats that are listening and in-range. The broadcast continues for a few minutes, then automatically turns off. Other skippers who want to join the race type “racing” in open chat to let their boats listen for the wind. 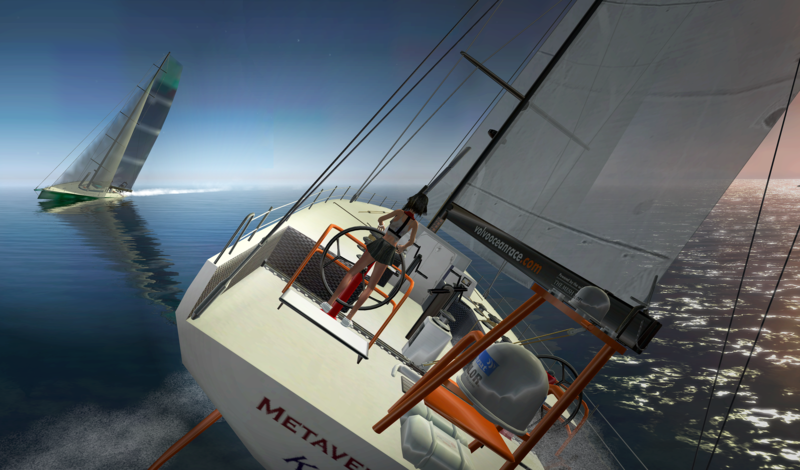 Once a boat gets the racewind message, it locks the new parameters and won’t allow any changes until the skipper says ‘cruising‘ and leaves race mode. The iPad interface is a great idea and it works well; it’s both easy and intuitive to use. My only suggestion would be to make the iPad transferable, so any RD could use it to start VO-70 races. I’d suspect sharing it will become more important as new boats get added to the list using the new system. It’s a small step toward establishing a legitimate, alternate race wind interface. The wind that drives a sailboat is often fickle, and adapting to wind changes is an important part of race strategy in both RL and SL. The standard WWC race wind script includes settings for wind variation. 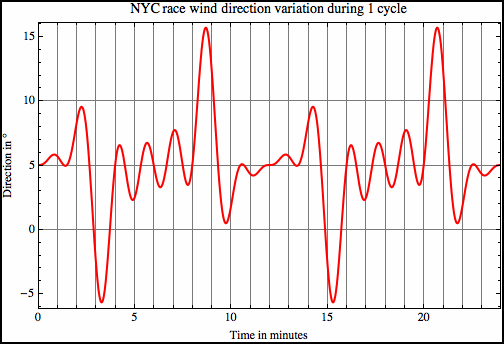 A race director can adjust the magnitude and nature of both wind gusts and directional shifts. In early 2008, Vin Mariani wrote two fantastic articles detailing how wind variance works in SL races (Blow and Second Wind). He focused on Kanker Greenacre’s original “Tako wind,” but the same basic principles apply to Mothgirl Dibou’s WWC setter too. As shown in the figure above-right, the racewind from these setters gradually shifts wind direction in incremental steps to one side then the other, over a few minute interval. A good skipper can watch the wind shift and adjust the sails in response; a great skipper can even try to anticipate when shifts will occur. I’m bringing this up here because the VO-70 uses a different system. VO-70’s iPad controller allows a race director to adjust the amplitude of wind gusts and directional shifts using an integer scale from 0 to 9. However, the frequency of the wind change is much faster than what you get with a WWC, and the two systems are not equivalent. Here’s an example of what I mean. The blue line on the chart to the right plots the real wind angle for a VO-70 each second for a total of eighty seconds, with the wind variance set to “5” on the iPad. As you can see, the curve is an irregular sawtooth pattern, with wind direction swinging back and forth around the mean every other second. 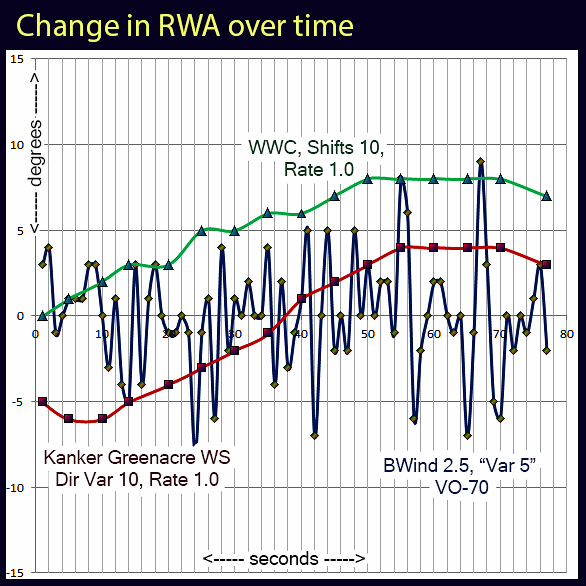 To emphasize the difference, I’ve superimposed the directional shift from a WWC (green curve) and Kanker’s windsetter (red curve) over the same timeframe. The WWC causes a gradual shift in wind direction, while the BWind 2.5 windsetter generates a sequence of quick wind shifts that leaves the underlying, average wind angle unchanged. Kain Xenobuilder and Becca Moulliez are aware of this difference, but they point out that the wind pressing against a sail (or any object) is constantly changing at a rapid rate. The VO-70 wind variation models this second-to-second wind jitter, not the gradual shifts a WWC produces. Becky mentioned that longer-term WWC-type variances may be included in future updates to the new wind system. Dutch suggested that racers should focus on the HUD readout for apparent wind, and sheet accordingly. That makes sense to me too, since the HUD’s AWA index reacts more slowly, and represents the wind angle and speed that actually drives the boat. Although the VO-70 does not use the WWC setter, it is fully compatible with the common race lines in SL. In fact, once a skipper enters race mode the boat automatically gives itself a random race number. 🙂 That should prevent the problem racers forgetting to correctly ID their boats! The large size, solid build, and low-overhead scripting of VO-70 make it a particularly good candidate for long-distance races, so the issue of phantom race course collisions should not amount to very much. 1. WWC compatibility. 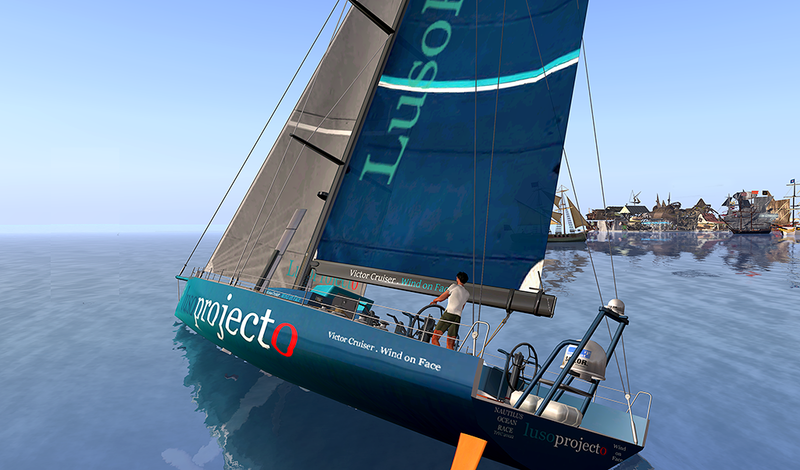 Since VO-70 uses it’s own wind system, right now it can’t join mixed-class races in SL without first making special arrangements with the Race Director. Having an option to switch between BWind 2.5 and the generic WWC wind would greatly increase the number of racing opportunities for this boat, and give owners a chance to ‘show it off’ to their friends. These are small points for a Big Boat however, and as I said I’m just greedy. 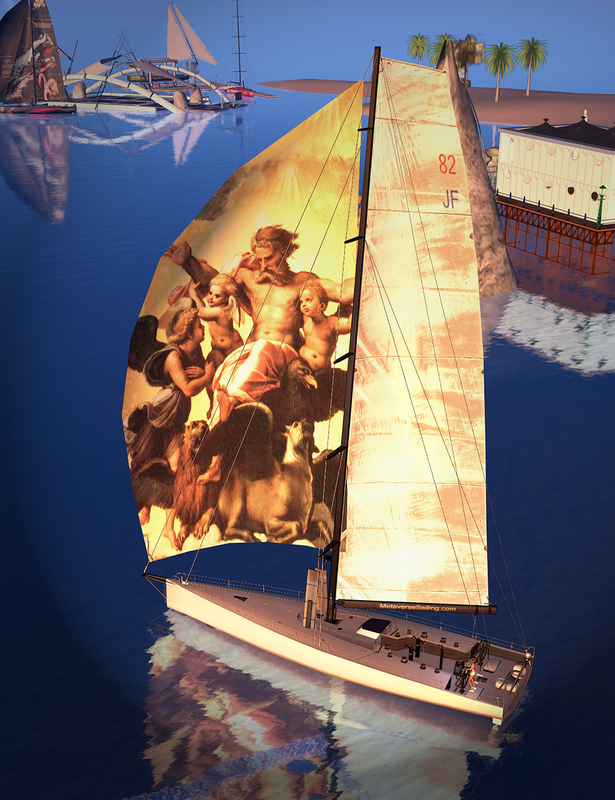 I want to sail this boat everyplace! 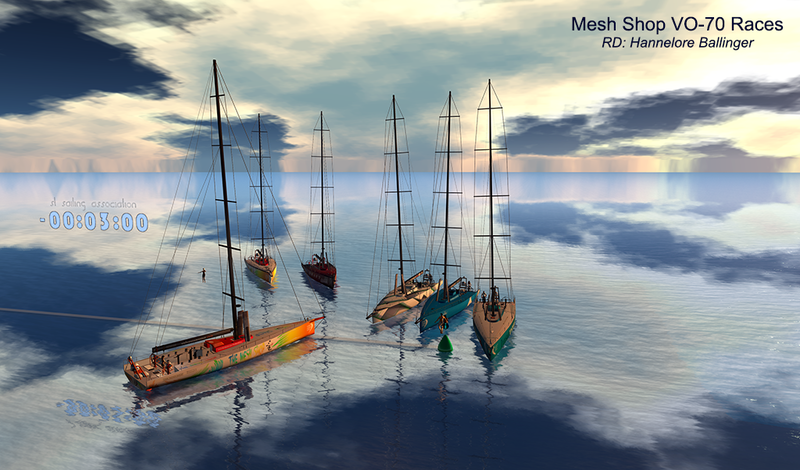 This entry was posted in Sailboats, VO-70. Bookmark the permalink. Yes Dutch is listening, and I know you agree he’s a pretty great designer/ builder. 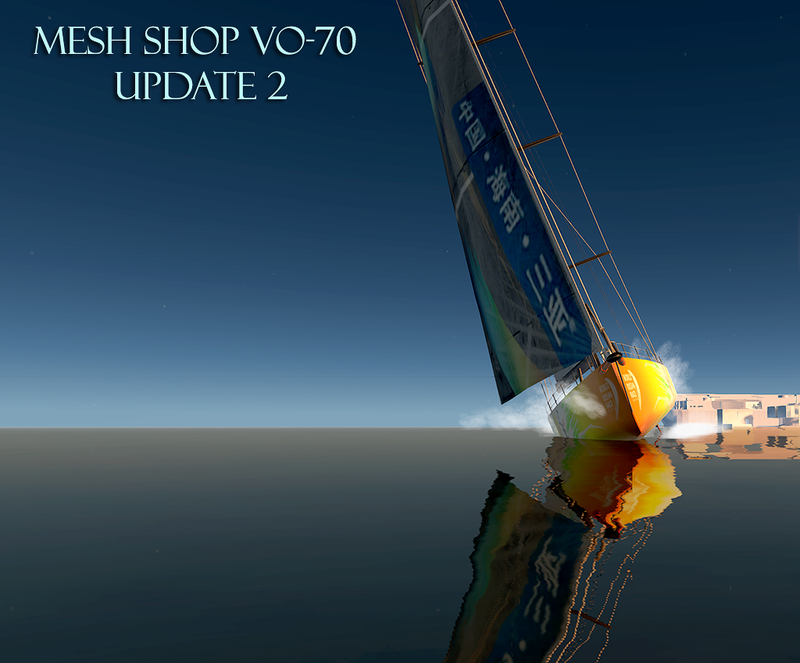 I think the two recent VO-70 upgrades demonstrate Dutch’s dedication to listen to user feedback and enhance this boat’s racing potential. However, nobody ever built a good boat “by committee.” This boat is Dutch’s baby, and any future changes are up to him. Hey, speaking of which, in the above article I suggested that Dutch make the iPad windsetters transferable so anyone could use them to start a race. Woots, it turns out Dutch already did something better. 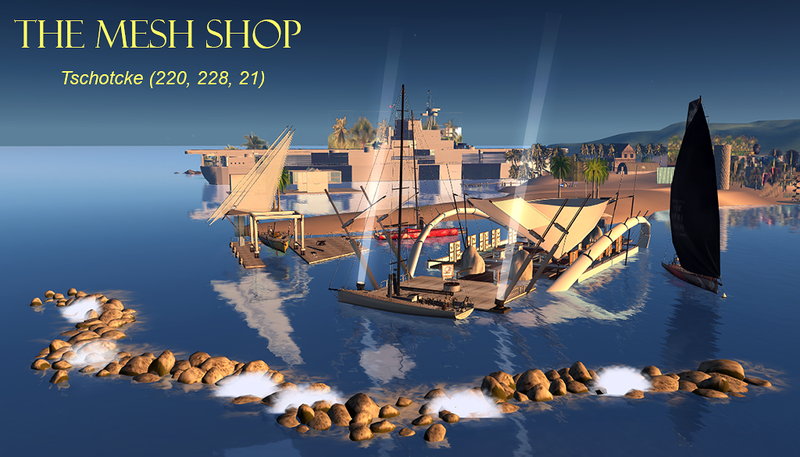 Anyone who stops by the Mesh Shop in Tschotcke can pick up a free iPad setter! Haha sounds good! I already posted a picture showing Chaos’ difficulty with the VO-70’s big wheel!